Recently ran into an issue where I couldn’t update my lab Exchange 2013 CU9 servers to Exchange 2013 CU10. I wanted to do so because Exchange 2016 had gone RTM and one of the requirement’s for coexistence of Exchange 2016 and Exchange 2013, is for Exchange 2013 to be running at CU10. One of things to note is that I had previously installed the Exchange 2016 BETA into my lab setup. [11/06/2015 21:40:05.0247]  [ERROR] The given key was not present in the dictionary. [11/06/2015 21:40:05.0247]  [WARNING] An unexpected error has occurred and a Watson dump is being generated: The given key was not present in the dictionary. [11/06/2015 21:40:06.0122]  0. ErrorRecord: The given key was not present in the dictionary. [11/06/2015 21:40:06.0122]  0. ErrorRecord: System.Collections.Generic.KeyNotFoundException: The given key was not present in the dictionary. ” was run: “System.Collections.Generic.KeyNotFoundException: The given key was not present in the dictionary. [11/06/2015 21:40:06.0169]  [ERROR] The given key was not present in the dictionary. [11/06/2015 21:40:06.0169]  Setup is stopping now because of one or more critical errors. [11/06/2015 21:40:06.0169]  Finished executing component tasks. [11/06/2015 21:40:06.0201]  The Exchange Server setup operation didn’t complete. 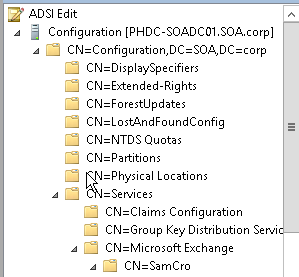 More details can be found in ExchangeSetup.log located in the <SystemDrive>:\ExchangeSetupLogs folder. Under Roles, there will be an existing entry named My ReadWriteMailbox Apps. Delete this entry, or rename it (I renamed it to My ReadWriteMailbox Apps2). Notice I have my duplicated entry that I renamed alongside my newly created one. Thanks for the blog, helped a lot.